There are many benefits to owning an effective garage door keypad, some of which include the ability to access your garage with as much convenience and security as possible. You can grant access to whoever you choose by simply offering them a security pin, and due to advanced security features on many of them, it’s nearly impossible for criminals to ‘hack them’ and enter your premises illegally. That being said, there’s a lot more hassle to set them up and use in many cases no matter how well they perform, due to complicated electrical installation processes, tools and expenses which turn many garage owners off. One of the major inherent benefits of a wireless garage door keypad system is that you don’t have to manually install hardware, even when replacing a garage door. This simple access also makes them a better economic option for large garages with many doors and people who require access to them, since you can get started, install and begin using them very quickly in many cases, and also install multiple doors. There are some other quality concerns, such as safety and if you’re a long-time garage owner, you know how susceptible they can be. In this review you’ll find a detailed and accurate analysis of some of the best wireless garage door keypads for 2016-2017, based on the qualities of safety, convenience, performance, economy and durability. 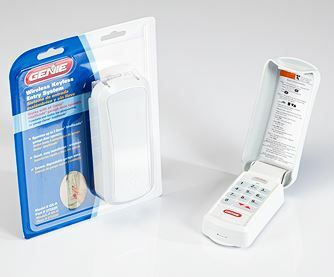 The Genie GK-R Intellicode2 Wireless Keypad is an exclusive unit to Genie garage door openers, and while this can be an economic make or break buying decision, there are inherent benefits to this as well as other convenience features to make up for it. First and foremost, Genie has been responsible for a satisfied customer base and is a company that’s lasted longer than sixty years in the garage door opener market, which is a clear indication that they’re doing something right. 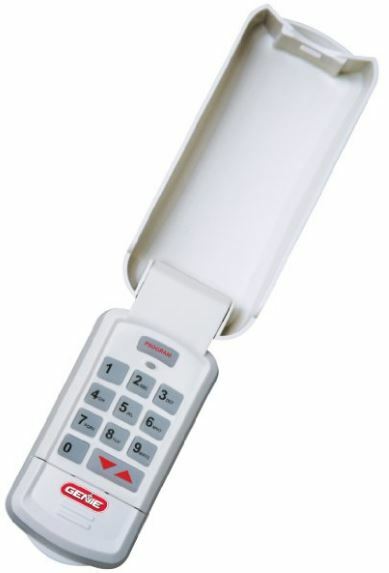 More specifically, this keypad maintains its up to date and top of the line security with its Intellicode technology. The version used is the latest Intellicode 2, however it’s backwards compatible with Intellicode 1 and is versatile and reliable enough to supply access to up to three garage door openers for greater performance and comfort. While there are economic advantages to this, it’s also worth mentioning that the quality of safety is raised heavily with its rolling code capability. This alters the frequency transmission code each time it’s used, making it virtually impossible for an intruder to remotely record and then later duplicate that frequency to open your garage doors. It also uses dual frequencies to communicate with the Genie garage door openers to reduce any interference and keep a strong, clear signal. There’s an auto seeking feature to make contacting the appropriate garage door opener easier and more reliable as well. The flip up cover adds a level of durability to its robust construction, however even though there’s a one year warranty included on parts, it begins to drain the AAA batteries it uses significantly. It doesn’t require batteries, however because of its wireless transmission performance if you do choose to use them for convenience of installation, you will probably want to wire it up to a power source later on, as an economic option. There’s also a back light built into it for easy viewing in the dark, as well as an LED to indicate the Intellicode mode selected. 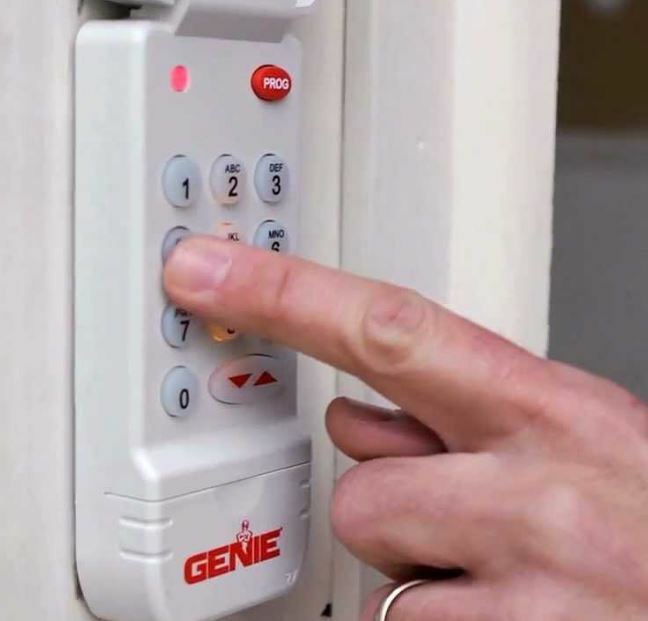 As with any wireless security technology a safe and effective connection is absolutely essential, and this keypad offers both performance and durability in this area, on top of the assumed ease of use. For starters, it also includes rolling code technology to prevent any duplication of the required frequencies used. 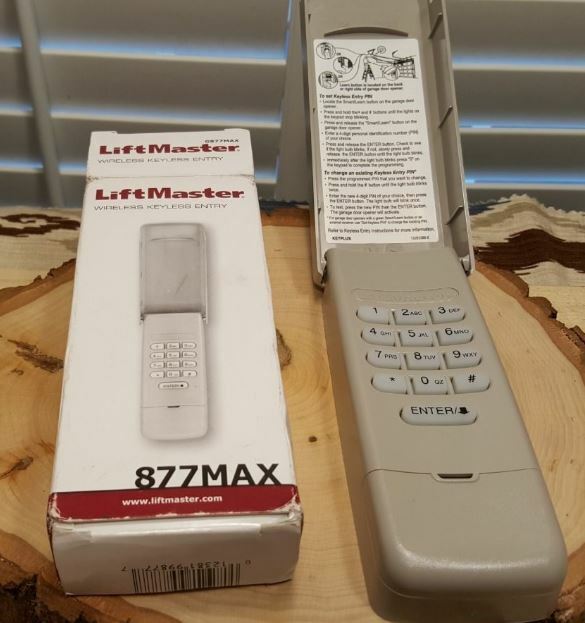 Next, the Liftmaster 877mas uses a single nine volt battery which is more reliable than many other wireless power options, and while there will always be lifespan considerations it provide enough power for all of its advanced features. This wireless garage door keypad actually allows for up to four garage door openers via the four unique pins available to program in its memory. 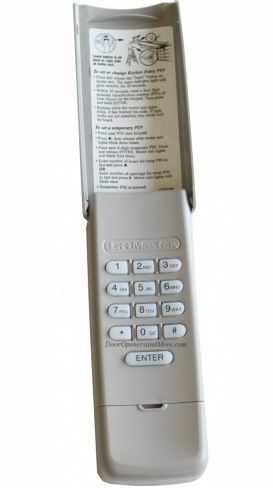 As you might expect, the compatibility is limited to any and all Liftmaster garage door openers manufactured since the beginning of 1993, however it syncs easily and quickly to their frequency. On the other hand, while it uses only a single frequency it doesn’t limit its security or comfort, as the Security+ 2.0 technology used is designed to be easy to program, and also supply a stronger, more reliable technology with an increased radio wave range. While it’s responsible to only use one personal security password, you can also create multiple temporary access passwords for those you wish to grant access to for a short period of time, such as for scheduled deliveries. To make it even easier to use, the number buttons feature a back light for easier viewing whether day or night. You can close your garage doors with a single button as well, so that you’re not going through a complicated process every time, however this feature only works with LiftMaster garage door openers that were manufactured from 2006 until the present day. In terms of durability, the 877mas is made by a reputable company that’s been an authority in the industry for decades, and with a lift up cover it’s designed to endure the outdoors over years of use. It also includes a warranty that guarantees all parts for a limited time, where they will replace anything covered by warranty for free including shipping charges. If you’re not happy with it after 30 days, LiftMaster has also supplied a 30 satisfaction conviction that will allow you to return it for a full refund except for shipping charges. This is a significant indication of the 877max’s integrity. Garage door opener technology has evolved significantly since the early nineties, and while the convenience of a garage door keypad makes sense, it must be compatible with every other component involved. What Chamberlain has done over the years is integrate their new technologies into each new unit, and one such technology that has stuck is frequency sensing capabilities. The Chamberlain 940EV offers compatibility with all Chamberlain brand garage door openers that have been produced since 1993, offering a considerable amount of versatility, considering that this is when they began including this sensor technology with all of their garage door openers. If your heart is set on using a Chamberlain garage door opener, then this keypad makes perfect sense, because with this compatibility requirement comes added ease of use. For starters, being a wireless system, it goes an extra step in being easy to install. Although it’s designed for use with garages that have a single garage door, it’s simple to program your garage door opener and security password into it. There’s mounting hardware included with it, and since you aren’t required to install it via electrical wiring, you can simply follow the instructions laid out and you’ll be up and running very quickly. It’s designed to use a battery which is included out of the box, and will provide economic use despite the high performance requirements, however you can also use a wired connection if you choose to, and save some money overall. 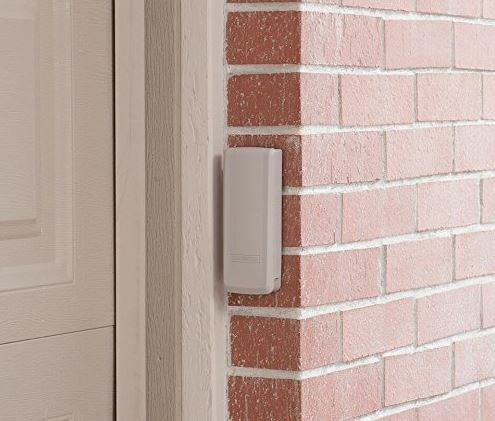 Next, it has added performance with dual band radio frequency capability that’s capable of connecting with a larger number of garage door openers, as well as hold a steady connection in areas with high amounts of radio interference. As you already know, you aren’t required to use a key or remote control to open your garage door with the 940EV installed, however what’s just as important is that it’s a secure option. It provides access via a custom programmable four digit pin code which makes it very simple to use, and with back lit buttons, you can easily see and use it while in the dark, and is an intuitive solution overall, with a simple button layout. 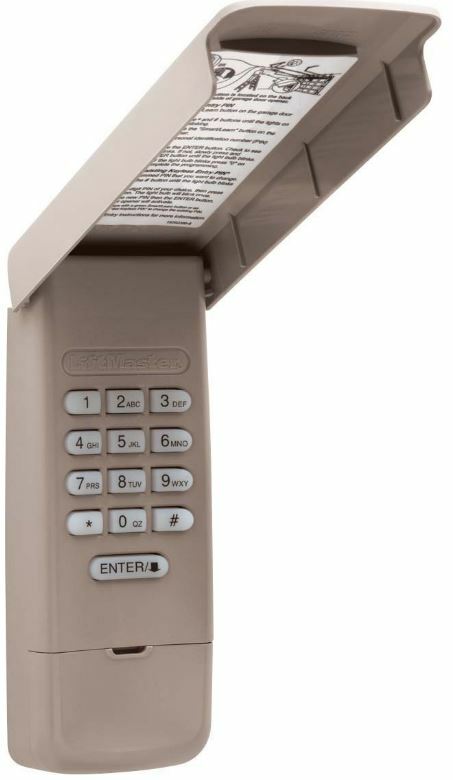 In terms of durability, like the other garage door keypads reviewed in this article, it has a weather proof cover built into it, which lifts open for quick access. It’s worthy of being added to the outside of your garage with its clean, gray exterior and weather endurance qualities. If you’re building or upgrading a garage and haven’t considered which garage door openers to use yet, or are looking for a better solution, each of these wireless keypads will serve you well. While they work exclusively with the garage door openers of their respective manufacturers, since they’re such effective and economic options, you won’t have to choose between cost savings and effective security. Due to technological advancements, each has been made more powerful and easy to use as well as secure, however those which allow you to program and use more garage door openers at one time offer their advantages. They all offer the ability to power with a wired electrical connection, however you won’t have to hire an electrician and pay make a huge commitment before you’re sure it’s right for you. Best of all, they’re all backed by manufacturer warranties and are capable of running completely wirelessly for the best convenience. can any of these be used with the open sesame handicapped house entrance door openers? Does any offer more secure keypads that allow pins with greater than 4 digits. Four digits provide too few combinations (10,000) for me to be comfortable with using one for access to my garage or house.